Handsome Wilson presented to vet extra neurology with a history of sudden onset weakness of his hind limbs, with moderate back pain stemming from a fall he had in September. After an examination carried out by Jacques it was recommended that Wilson have an MRI scan to ascertain the reason for his hind limbs weakness. The MRI scans showed a protrusion of a vertebral disc over Wilson’s chest (see top photo, large white arrow) to be causing his weakness. 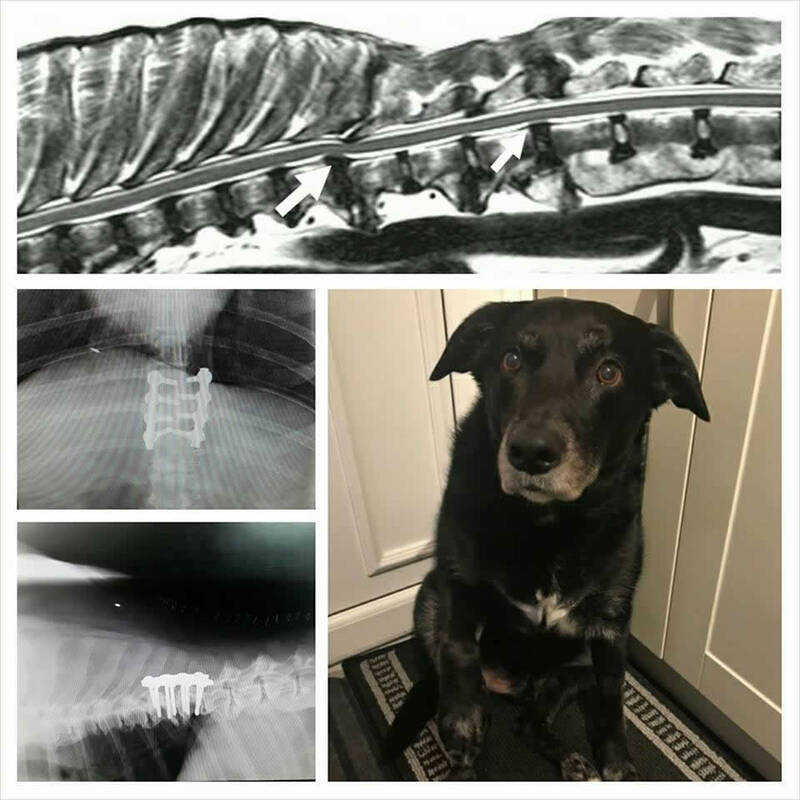 Wilson had surgery to firstly decompress the spinal cord by removing the bone causing the compression and then secondly Jacques stabilised the vertebral column using metal plates (see photos on the left). Wilson was with us for approximately a week and became a firm favourite with the nurses caring for him. A gentleman of a patient. His owners are starting his rehabilitation and are very happy with his progress. We wish Wilson and his owners a smooth recovery and we look forward to hearing more of his updates. Your nursing team miss you already Wilson!! !